What impressions do you have after the visit of Igor Mazurenko? Very good, I became closer to this guy and there were really good impressions, we had a great time. Have you talked with him about something interesting, related to your match, or about anything secret? 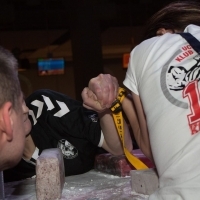 We discussed many issues, not just armwrestling. As for the secrets, there is one very interesting secret that I think will make all my fans happy when the time comes. What are your plans for the future? How will your career be built? I have a plan - I want to become the best in the world, not just the winner of the World and European Championship! Now your photos and videos are gaining popularity in the Internet, people in the street, too, want to make a picture with you. Do you like being in the center of attention when everyone talks about you? People are asking to publish more videos and photos and I really love to shoot photos and videos with my fans. I really enjoy being in the spotlight. It's nice when people tell you kind words! Dave Chaffee: The truth behind the "Easy Money".